The names of 360 U.S. law enforcement officers who have died in the line of duty will be formally dedicated on the walls of the National Law Enforcement Officers Memorial during the 30th Annual Candlelight Vigil held on the National Mall between 4th and 7th streets in Washington, DC, at 8:00 pm on May 13, 2018. U.S. Attorney General Jeff Sessions and Secretary of the Department of Homeland Security Kirstjen Nielsen will deliver special remarks and lead in candle lighting and reading the names of the fallen officers. The names of 360 officers added to the Memorial this year include 129 who made the ultimate sacrifice during 2017, in addition to 231 officers who died earlier in history but whose sacrifice had not been previously documented. With these additions, there are 21,541 officers’ names engraved on the Memorial, representing all 50 states, the District of Columbia, U.S. territories, federal law enforcement, and military police agencies. Includes musical tributes, special remarks and reading of 360 names as they are dedicated on the National Law Enforcement Officers Memorial. Live webcast is available through www.UnitedByLight.org. Media representatives must arrive and check in before 2:30 pm. 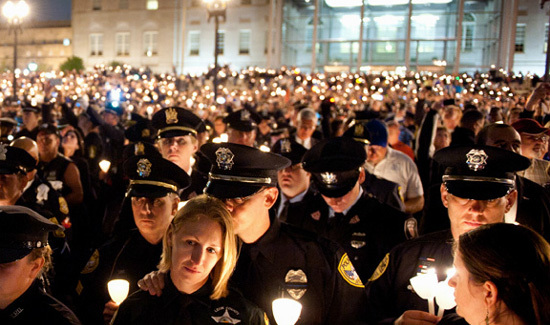 Each May 13, an estimated 20,000 people assemble for the Candlelight Vigil, a signature event of National Police Week. For the tenth year, the ceremony will be streamed live over the Internet so that everyone can witness this annual tribute to America’s law enforcement officers. Individuals interested in the free webcast can register online at www.UnitedByLight.org. MEDIA CREDENTIALS: Media representatives planning to cover the Candlelight Vigil are asked to register for credentials in advance. Go to www.LawMemorial.org/credentials for details. Media check-in will open at noon on May 13 and will be located on the northwest corner of 4th Street SW and Jefferson Drive SW. Media representatives must first check in to pick up credentials before accessing the site. Space on the media riser is limited to one (1) credentialed representative per media outlet. All media equipment must be in place prior to the sweep scheduled to begin at 2:30 pm. Equipment may not be left unattended at any time other than during the sweep. Parking is extremely limited. If you require a satellite truck to conduct live shots from the Vigil, please contact Steve Groeninger, 202-737-7135 or steve@nleomf.org, to reserve and receive a parking location for your vehicle.